For those of you unfamiliar with "Dust Off", It is air in a can. Yes, I know, it seemed like a rip-off to me too, but the marketing secret is that they cram so much air in there that it sprays out with the force of a water cannon, using puffs of air instead of a devastating ramrod of liquid discipline. It is hard to tell how much is inside because there is never enough dust around to find out, unless you live in the Overlook hotel or something. 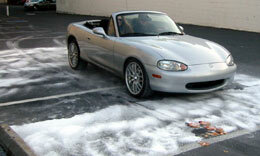 In order to accurately quantify a can of Dust Off, I had to fabricate a giant patch of dust. 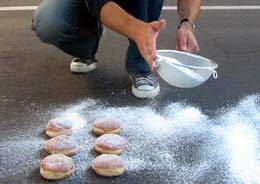 Thanks to my baking experience, I had the perfect solution: powdered sugar. 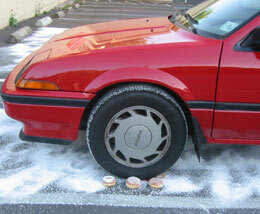 With a couple of colanders I set about preparing a fine blanket of dusty powder in the parking lot behind my house. Dust off was invented by two entrepreneurial nightclub owners in Trenton, New Jersey. The year was1988. They needed a quick way to remove unwanted angel dust from their pure marijuana cigarettes. 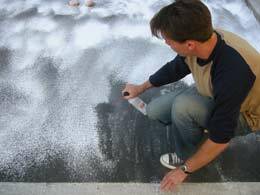 One night, A graffiti-artist friend brought in an empty spray-paint can and showed them how the leftover compressed gasses could be used to get incredibly high. A few weeks later, when they got out of the hospital, a product called "Dust off" was born. 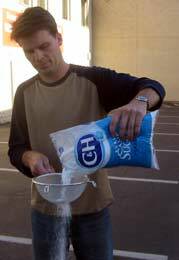 I prefer C& H sugar, it is pure white, disperses easily and settles evenly. I use it at home, outdoors and in the office. 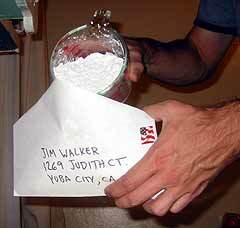 In the four pound bag there is enough powdered sugar to dust 384 square feet, or fill about 28 envelopes. I shouldn't joke about Dust off. It is a serious product. It even states that it is a serious product on the can. How many other products inform you of their serious nature? Not radiator fluid, not bleach. Not shotgun shells, Altoids or even home pregnancy tests tell you how serious they are. In this respect, Dust off is the opposite of silly string. Dust Off cannot stand being called "instant party". Soon I had created a vast, hot dusty area to perform my wacky experiments. I dubbed this area "the playa". With my proving grounds prepared, I opened up the can of dust off and affixed the complimentary coffee stirrer to the spray nozzle. The powdered sugar didn't stand a chance as the Dust Off did its work. 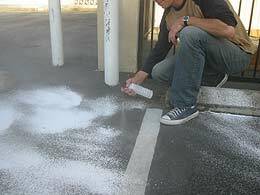 I felt like an illegal immigrant at the Willy Wonka chocolate factory, carefully spraying sugar from the blacktop with my little can. As the can emptied, it got cold. Very cold. Ice started to form on the outside of the can and the air flow slowed down quite a bit. This cooling effect is caused by the change of pressure in the can, but the explanation is really long-winded, so instead I'm going to blame.... BLACK MAGIC and VOODOO! The tiny demons in the can are flying out! The heat of the can is dropping so fast the can is freezing! Bad spirits! Bad Juju! 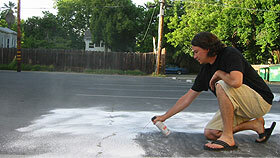 While I was busy speaking in tongues and shaking my crows foot, Rob J. took over spraying the sugar. It took longer than I expected. They really pack the difluoroethane in there! With a final gasp, the can expired. It had cleared 41 square feet of dust. I was genuinely impressed. 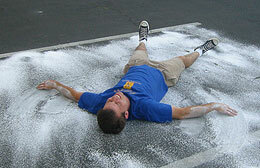 We never get snow in Sacramento, so I took this opportunity to make an old style sugar angel. 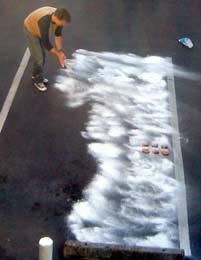 Most of the three parking spaces were still covered with sugar. 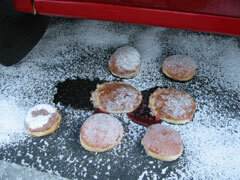 I ran over the cherry-filled donuts in my haste to get into this sweet parking spot. 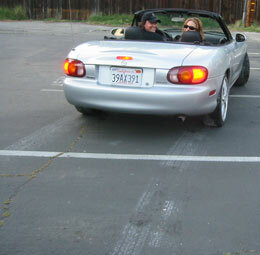 Rob and Helen wanted a shot at the donuts too, so I moved my car to give them a try. Rob hit them easily, but regretted it soon afterwards, when he was washing the tart cherry goo off of his paint job. Dust Off surprised me with its hearty capacity. 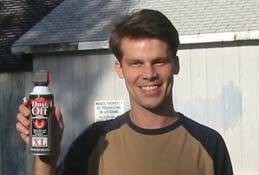 One can of this stuff should last for years in normal use, not including the air-wars, jet propulsion experiments, huffing and other hi-jinks that typically occur with such an innovative product. Last updated July 27, 2002.